This entry was posted on August 3, 2013 at 8:49 am and is filed under learning to sew. You can subscribe via RSS 2.0 feed to this post's comments. Both comments and pings are currently closed. 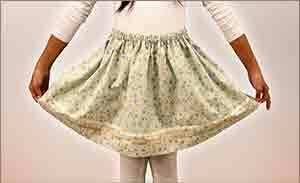 Your blog posts about skirts have really been timely! Thanks for such a thorough treatment of the subject. Like you, I stick mainly to 6-gore (with waist darts) and very long about 37″. I keep hoping to find some other style that I like, but any time I try something else I feel like the style is just not as flattering. What is the hem circumference of your 6-gore? Mine have typically been about 51″ but this necessitates a slit or something so I can walk. In the winter I like to wear knee-his (usually nylons) and since I don’t want the tops of my socks to show I wear a black slip (my skirts are all black, denim or navy). I understand that visible slips are a no no, but I thought it was better than seeing my nylons. What options would you suggest to avoid the slit problem but still allow ease of walking? Thanks Pamela. 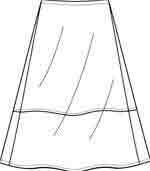 See my post on a 6-gore skirt pattern for the hem width I use. 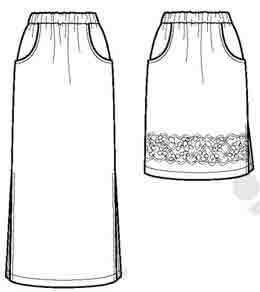 46 inch hips + 24 inch flare gets the hem length up to 70 inches, plenty enough for walking in a skirt 37 – 40 inches long.